Each mL contains: ACTIVE: pemirolast potassium 1 mg (0.1%); PRESERVATIVE: lauralkonium chloride 0.005%; INACTIVES: glycerin, dibasic sodium phosphate, monobasic sodium phosphate, phosphoric acid and/or sodium hydroxide to adjust pH, and purified water. The osmolality of ALAMAST® ophthalmic solution is approximately 240 mOsmol/kg. 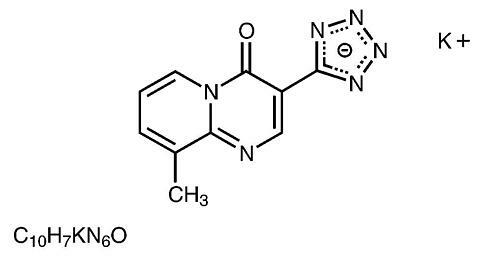 Mechanism of Action: Pemirolast potassium is a mast cell stabilizer that inhibits the in vivo Type I immediate hypersensitivity reaction. In vitro and in vivo studies have demonstrated that pemirolast potassium inhibits the antigen-induced release of inflammatory mediators (e.g., histamine, leukotriene C 4 , D 4 , E 4 ) from human mast cells. Pharmacokinetics: Topical ocular administration of one to two drops of ALAMAST® ophthalmic solution in each eye four times daily in 16 healthy volunteers for two weeks resulted in detectable concentrations in the plasma. The mean (±SE) peak plasma level of 4.7 ± 0.8 ng/mL occurred at 0.42 ± 0.05 hours and the mean t 1/2 was 4.5 ± 0.2 hours. When a single 10 mg pemirolast potassium dose was taken orally, a peak plasma concentration of 0.723 [micro ]g/mL was reached. In clinical environmental studies, ALAMAST® was significantly more effective than placebo after 28 days in preventing ocular itching associated with allergic conjunctivitis. ALAMAST® ophthalmic solution is indicated for the prevention of itching of the eye due to allergic conjunctivitis. Symptomatic response to therapy (decreased itching) may be evident within a few days, but frequently requires longer treatment (up to four weeks). ALAMAST® ophthalmic solution is contraindicated in patients with previously demonstrated hypersensitivity to any of the ingredients of this product. Information for patients: To prevent contaminating the dropper tip and solution, do not touch the eyelids or surrounding areas with the dropper tip. Keep the bottle tightly closed when not in use. Patients should be advised not to wear contact lenses if their eyes are red. ALAMAST® should not be used to treat contact lens related irritation. The preservative in ALAMAST®, lauralkonium chloride, may be absorbed by soft contact lenses. Patients who wear soft contact lenses and whose eyes are not red should be instructed to wait at least ten minutes after instilling ALAMAST® before they insert their contact lenses. Carcinogenesis, mutagenesis, impairment of fertility: Pemirolast potassium was not mutagenic or clastogenic when tested in a series of bacterial and mammalian tests for gene mutation and chromosomal injury in vitro nor was it clastogenic when tested in vivo in rats. Pemirolast potassium had no effect on mating and fertility in rats at oral doses up to 250 mg/kg (approximately 20,000 fold the human dose at 2 drops/eye, 40 µL/drop, QID for a 50 kg adult). A reduced fertility and pregnancy index occurred in the F 1 generation when F 0 dams were treated with 400 mg/kg pemirolast potassium during late pregnancy and lactation period (approximately 30,000 fold the human dose). Teratogenic effects: Pregnancy Category C. Pemirolast potassium caused an increased incidence of thymic remnant in the neck, interventricular septal defect, fetuses with wavy rib, splitting of thoracic vertebral body, and reduced numbers of ossified sternebrae, sacral and caudal vertebrae, and metatarsi when rats were given oral doses >/=250 mg/kg (approximately 20,000 fold the human dose at 2 drops/eye, 40 uL/drop, QID for a 50 kg adult) during organogenesis. Increased incidence of dilation of renal pelvis/ureter in the fetuses and neonates was also noted when rats were given an oral dose of 400 mg/kg pemirolast potassium (approximately 30,000 fold the human dose). Pemirolast potassium was not teratogenic in rabbits given oral doses up to 150 mg/kg (approximately 12,000 fold the human dose) during the same time period. There are no adequate and well-controlled studies in pregnant women. Because animal reproductive studies are not always predictive of human response, ALAMAST® ophthalmic solution should be used during pregnancy only if the benefit outweighs the risk. Non-teratogenic effects: Pemirolast potassium produced increased pre- and post-implantation losses, reduced embryo/fetal and neonatal survival, decreased neonatal body weight, and delayed neonatal development in rats receiving an oral dose at 400 mg/kg (approximately 30,000 fold the human dose). Pemirolast potassium also caused a reduction in the number of corpus lutea, the number of implantations, and number of live fetuses in the F 1 generation in rats when F 0 dams were given oral dosages >/=250 mg/kg (approximately 20,000 fold the human dose) during late gestation and the lactation period. Nursing Mothers: Pemirolast potassium is excreted in the milk of lactating rats at concentrations higher than those in plasma. It is not known whether pemirolast potassium is excreted in human milk. Because many drugs are excreted in human milk, caution should be exercised when ALAMAST® ophthalmic solution is administered to a nursing woman. Pediatric Use: Safety and effectiveness in pediatric patients below the age of 3 years have not been established. In clinical studies lasting up to 17 weeks with ALAMAST® ophthalmic solution, headache, rhinitis, and cold/flu symptoms were reported at an incidence of 10-25%. The occurrence of these side effects was generally mild. Some of these events were similar to the underlying ocular disease being studied. No accounts of ALAMAST® ophthalmic solution overdose were reported following topical ocular application.